For years bros, meatheads, and gym rats around the world have posed pressing questions: What can you bench? Can I skip leg day? What goes in this protein shake? And, importantly, do you even lift, bro? At long last, answers to these questions and more can be found in one handy volume - The Swoly Bible, written by the Internet's favorite gym expert/literary genius, Dom Mazzetti. 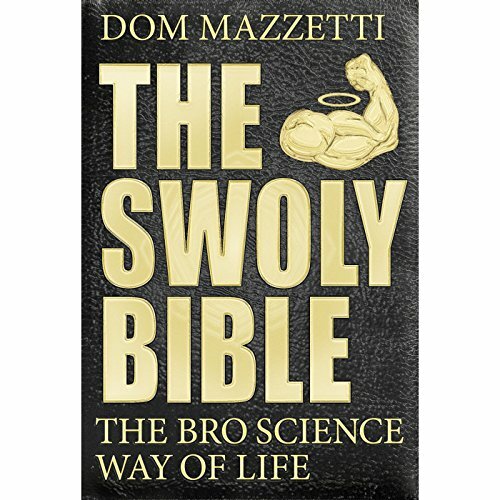 Written in Dom's signature comedic voice, The Swoly Bible is the perfect gift for anyone in your #fitfam. thank you Don for self narration. many laughs, but if you watch the YouTube channel you heard most the material already. Dom is a comically douchey character off YouTube. Not to be confused with the many tragically douchey characters on YouTube. If you're like me and you think mostly in sarcastic insults and bodybuilding references this book is perfect for you. Would you consider the audio edition of The Swoly Bible to be better than the print version? Did not read print version. The comical entertainment, and stereotypes. What does Dom Mazzetti bring to the story that you wouldn’t experience if you just read the book? His New Jersey accent and the way he portrays the wording. A lot of the YouTube videos are rehashed here but it's amazing to workout to. I listened to this with earbuds while walking around campus. I was constantly laughing and smiling. Sometimes I'd zone out while listening and be looking at someone with a huge smile on my face. Made for some awkward times! Great book! This is the best narrator in the game! Hand to Jesus, I put on 15 pounds just listening to this. The Dom Mazzetti/BroScience brand represents some of the best satire you will ever read/listen to/watch. I remember the first video I ever watched, "Dom does drunk chicks" from then on I was hooked. I thought the BroScienceLife pivot from the Dom Mazzetti channel was a brilliant idea. You can't be a late twenties/early thirdies college student who is just looking to party and get wasted your whole life. But you can be in your late twenties and still be into lifting and relate to all the cultural anicdotes that BroScience takes advatage of. If you like extremly well written satirical humor about weight lifting culture as well as some hilarious puns then this is a great book for you. But, if you are someone like myself who has watched ever single BroScience video since the channel began then you're going to be a little disappointed because there is not that much new content. Honestly what I would do if I where just discovering BroScience Life is go on and watch every video on the channel in a row, and then buy a shirt or some Gnar pump and rock that swag in your local Iron Church. I'm guessing that would make the Brofesser just as proud of you as buying this audio book. best book I've come to know in my life, every man's book in my opinion, read it. A pump for your ear muscles! Have you ever been at home wondering how you can get a sick pump on after the gym, while you are taking your required "rest"? Well look no further! Brofessor Dom has got you covered with the sickest and most detailed book on all things broscience and life in the gym, or as we all know it: on life. Taking heavily from the brosciencelife YouTube videos, he has built a book that will appeal to fans and was for sure worth the coin and time; what else do you need to spend money on? Others? Pass. Do yourself a favor, small guy, start getting learned.